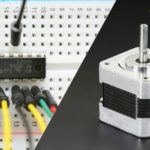 If you are planning on assembling your new robot friend, you will eventually want to learn about controlling DC motors. 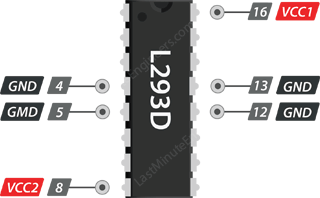 One of the easiest and inexpensive way to control DC motors is to interface L293D Motor Driver IC with Arduino. It can control both speed and spinning direction of two DC motors. And as a bonus, it can even control a unipolar stepper motor like 28BYJ-48 or Bipolar stepper motor like NEMA 17. 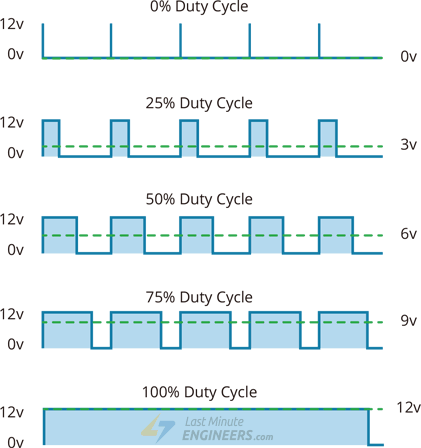 Below image illustrates PWM technique with various duty cycles and average voltages. 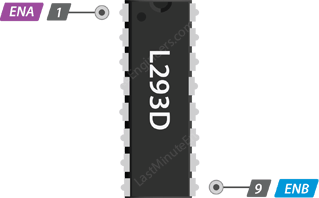 The L293D is a dual-channel H-Bridge motor driver capable of driving a pair of DC motors or one stepper motor. That means it can individually drive up to two motors making it ideal for building two-wheel robot platforms. The L293D motor driver IC actually has two power input pins viz. ‘Vcc1’ and ‘Vcc2’. Vcc1 is used for driving the internal logic circuitry which should be 5V. From Vcc2 pin the H-Bridge gets its power for driving the motors which can be 4.5V to 36V. And they both sink to a common ground named GND. 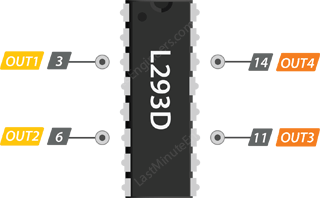 The L293D motor driver’s output channels for the motor A and B are brought out to pins OUT1,OUT2 and OUT3,OUT4 respectively. You can connect two DC motors having voltages between 4.5 to 36V to these terminals. Each channel on the IC can deliver up to 600mA to the DC motor. However, the amount of current supplied to the motor depends on system’s power supply. 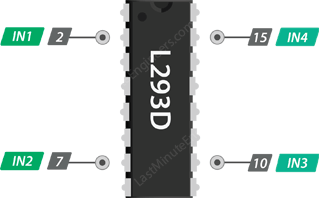 For each of the L293D’s channels, there are two types of control pins which allow us to control speed and spinning direction of the DC motors at the same time viz. Direction control pins & Speed control pins. Using the direction control pins, we can control whether the motor spins forward or backward. These pins actually control the switches of the H-Bridge circuit inside L293D IC. The IC has two direction control pins for each channel. The IN1,IN2 pins control the spinning direction of the motor A while IN3,IN4 control motor B. The spinning direction of a motor can be controlled by applying either a logic HIGH(5 Volts) or logic LOW(Ground) to these pins. The below chart illustrates how this is done. The speed control pins viz. ENA and ENB are used to turn ON, OFF and control speed of motor A and motor B respectively. Now that we know everything about the IC, we can begin hooking it up to our Arduino! Start by connecting power supply to the motors. In our experiment we are using DC Gearbox Motors(also known as ‘TT’ motors) that are usually found in two-wheel-drive robots. They are rated for 3 to 9V. So, we will connect external 9V power supply to the Vcc2 pin. Next, we need to supply 5 Volts for the L293D’s logic circuitry. Connect Vcc1 pin to 5V output on Arduino. Make sure you common all the grounds in the circuit. 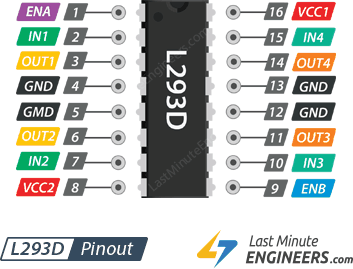 Now, the input and enable pins(ENA, IN1, IN2, IN3, IN4 and ENB) of the L293D IC are connected to six Arduino digital output pins(9, 8, 7, 5, 4 and 3). Note that the Arduino output pins 9 and 3 are both PWM-enabled. Finally, connect one motor to across OUT1 & OUT2 and the other motor across OUT3 & OUT4. You can interchange your motor’s connections, technically, there is no right or wrong way. 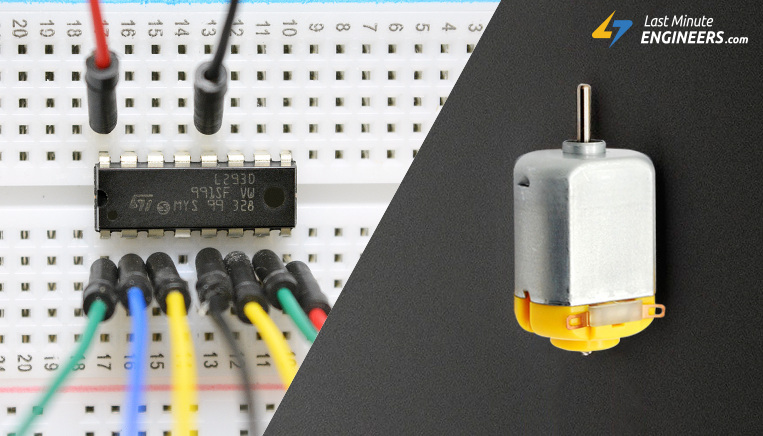 The following sketch will give you complete understanding on how to control speed and spinning direction of a DC motor with L293D motor driver IC and can serve as the basis for more practical experiments and projects. The arduino code is pretty straightforward. It doesn’t require any libraries to get it working. 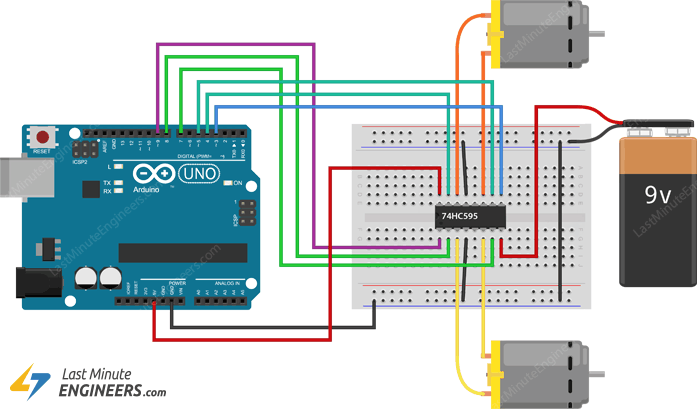 The sketch starts with declaring Arduino pins to which L293D’s control pins are connected.